Using advertising such as, ”Begin your genetics journey” to reach an innate desire we have to know what makes us unique, companies like 23andMe and Ancestry.com have made direct-to-consumer (DTC) genetic testing very popular in the past decade. Just how popular have they become? On April 6th, 2017, 23andMe announced they had genotyped more than two million customers. This equates to every person in the city of Sacramento, California having their DNA sequenced by 23andMe! What is direct-to-consumer (DTC) genetic testing? Just as the name suggests, DTC genetic testing is marketed directly to the public and can be ordered without a healthcare provider being involved. DTC testing often requires that consumers pay for their tests out-of-pocket. As of right now, costs range from $99 USD and up – all while offering to provide information on hundreds of genes. But since the average cost of genetic testing ordered by a healthcare provider can be $1,000 or more, doesn’t it make you question whether the information you get from DTC genetic testing is just as accurate? How are DTC genetic tests and genetic tests ordered by a healthcare provider different? DTC genetic testing labs are not required to meet the quality standards that all medical-grade genetic testing lab need to meet. Although some DTC labs have achieved these, not all of them have. As well, DTC genetic testing may not completely study a gene, whereas genetic testing ordered by a healthcare provider often does (more on this later). Lastly, DTC genetic testing labs may not provide a complete interpretation or explanation of the results, which can be tricky to sort out on your own. If you get genetic testing through your healthcare provider, he or she is there to help you understand any implications beforehand testing, as well as what you might get back for results. So, what kind of information can DTC tests tell me? 1. Ancestry: Have you ever wondered where your ancestors came from? One of the most popular reasons that people order DTC testing is to learn where their ancestors are from, and to find other relatives based on their DNA. Researchers have established more than thirty ancestry-based populations from around the world using reference genomes. When you do ancestry-based genetic testing, small sections of your DNA are matched to the corresponding sections in these reference genomes. The results across your entire genome are tallied to determine your ancestry makeup. In addition to the DNA contained in all the genes in your chromosomes, mothers pass down copies of the DNA in their mitochondria (mtDNA) to all their children. Mitochondria, often known as the energy “powerhouse” of the cell, are small structures that are responsible for generating energy from what we eat and drink. Interestingly, our mitochondrial DNA shuffle around very little when they are passed from mother to child. Because of this, changes (or mutations) in mitochondrial DNA are often seen as a great way to trace your mother’s ancestry…and her mother’s… and her mother’s! 2. Traits: Do your ears hang low? Did you know that there are several scientific papers written about earlobe genetics? While we used to think that whether your earlobes were “attached” or “unattached” was based on a single gene, we now know that there are dozens of gene polymorphisms that are associated with this trait. 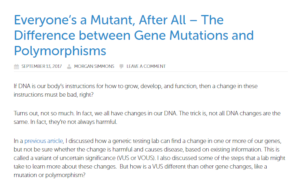 (Check my last post for more on polymorphisms). Associations between polymorphisms and genetic traits are made by looking at genetic and survey data from thousands of individuals who have agreed to participate in research. Researchers categorize people based on their different traits like hair color, whether they have dimples, caffeine consumption, whether they can smell a specific asparagus metabolite in their pee, things like that. They look to see if these individuals have similarities in their gene sequences. While we’ve identified many polymorphisms associated with these traits, it’s very likely that we haven’t identified all of them. Take me, for example – I was predicted to have unattached earlobes and mine are quite securely attached! It’s certainly interesting to see whether your predicted traits agree with what you see in the mirror (and what you can smell when you pee!). 3. Health: Are you a carrier for a genetic condition? Some DTC genetic tests can tell you whether you carry gene changes that may not affect your health directly, but could find you to be a carrier for a genetic condition. This could impact the health of your family members or your chance to have a child with that genetic condition in the future. Even if you don’t know of any genetic conditions in your family, it’s incredibly common to be a carrier for one or more genetic conditions. 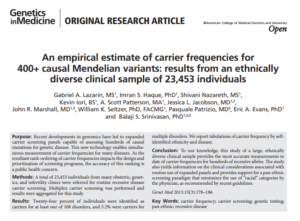 In fact, in a 2013 study published in Genetics in Medicine found that in nearly 25,000 participants, nearly one in four people was found to be a carrier for least one of 108 genetic conditions. More than 5% were carriers for more than one condition. There can be thousands of mutations in a single gene that cause a genetic disease. It’s not uncommon for DTC testing to only look for a few of the most common mutations in each gene – missing other, less common, mutations. This makes a difference when you look at the result and what it means. If you’re interested in learning about your risk to have a child with a genetic condition, it’s best to talk to your doctor or speak to a genetic counselor about this to get the most complete information. 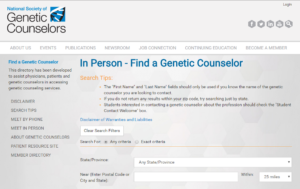 In the U.S., you can look for a local genetic counselor on the Find a Genetic Counselor website by the National Society of Genetic Counselors. In Canada, you can find a local genetics clinic by searching on the website for the Canadian Association of Genetic Counsellors. 4. Health: Are you at risk for a disease? Although polymorphisms generally do not cause disease, they may be associated with a (sometimes slightly) higher risk of certain diseases. However, this is not a thorough look, especially in people who have a personal or family history of a genetic condition. Interpreting your results accurately is key. People who know of a genetic condition in their family will probably be better served by seeking genetic counseling and genetic testing ordered with a doctor or genetic counselor. If you order DTC genetic testing and bring the results to a doctor or genetic counselor to talk about them, they may not recommend any additional testing or action because of their confidence in the results or other reasons that they would explain to you. Using DTC testing for medical purposes can create more questions than answers. As well, DTC test results often need to be repeated in a medical-grade genetic testing lab to confirm your result. Unfortunately, this means more time and (likely) more money coming out of your wallet… but for something needed. Is there anything I should know before I order DTC testing? I too am guilty of not reading the incredibly long “Terms and Conditions” pages for many things. However, when it comes to your genetic information, read the fine print! Make sure you know what the DTC company is going to do with your genetic information and data after your results are complete. Are they asking for permission to use the information for research? Will they share the information with other companies? These are good things to consider before you send in that sample. 2. Be wary of sharing your genetic information. A common option that DTC testing companies offer is that you can download all your raw genetic data in a file that can be kept on your computer or uploaded to third-party analysts. The costs for these third-party sites can vary. Although we are often told that, “More is better,” remember that this is your personal health information. Be wary of who has access to it. Would you trust them with your Social Security number? Additionally, the reports and explanations that you later receive may not be very clear and you may need help with understanding them. Although there are laws in place in the U.S., Canada, and other countries that forbid health insurance companies and employers from discriminating against you based on your genetic status, there are no such rules for life insurance, long-term care insurance, disability insurance, mortgage insurance, and other coverage that people sometimes need in their lives. Don’t be surprised if you are asked about whether you are at increased risk for a genetic condition, which may negatively impact your application for a policy. Although it shouldn’t be considered a substitute for an evaluation in the healthcare system, DTC genetic testing provides access to something really cool – an opportunity to peer inside your genes at a relatively low cost. However, the information may not paint a full picture. So, set your expectations based on the type of test you are ordering, and remember that it is all personal health information – so treat it carefully. Thanks, Morgan. Often, people think by ordering a test “secretly” and not sharing the results that a life or other insurance company can’t hold the results against you since they don’t get the results. Unfortunately, on the insurance application form they will often ask you if you are aware of any particular condition. If you answer no and they find out later that you knew, your insurance claim can be denied. You’re very welcome, Dave! You’re right, ordering any kind of genetic testing is certainly a big decision and it’s important to think about all of the possible outcomes before clicking ‘order.’ Thanks for reading! Morgan, thank you for making this simple to understand and putting the long-term implications in plain view. Love reading your posts and the learnings that you continue to deliver to shed insights into this fascinating world of genetics. Hi, Carol! Thank you so much for reading my post – I’m glad that I’m able to share such important information with our readers! I have GNE myopathi and i want to join your test. Hi, Dany! Thanks for reading my post. ThinkGenetic doesn’t offer genetic testing, but we’d love for you to subscribe to our newsletter (https://www.thinkgenetic.com/register) to hear about everything we’re doing.